Happy Friday! The weather here has been amazing the past couple of days and since the "unofficial" start of summer begins this weekend, I'm confident that the nice temperatures are here to stay. 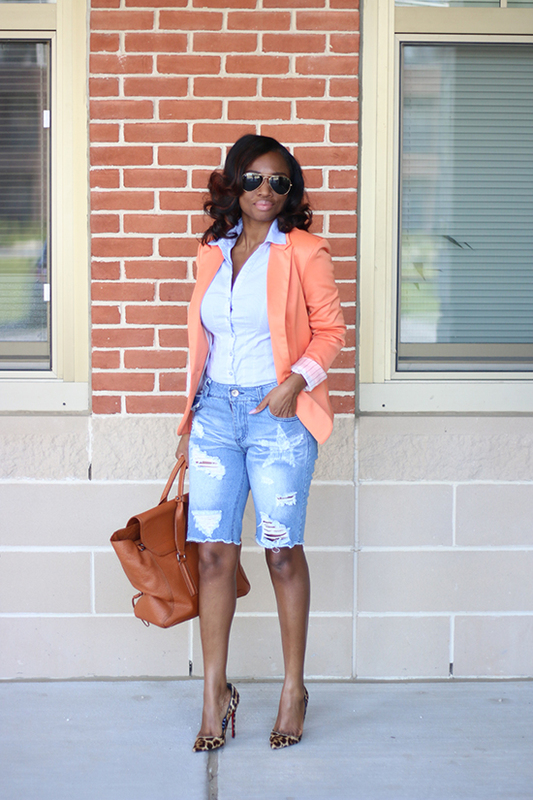 Pairing a blazer with shorts is always a great way to stay casual and stylish during the day and warm on those chilly or unpredicted nights. 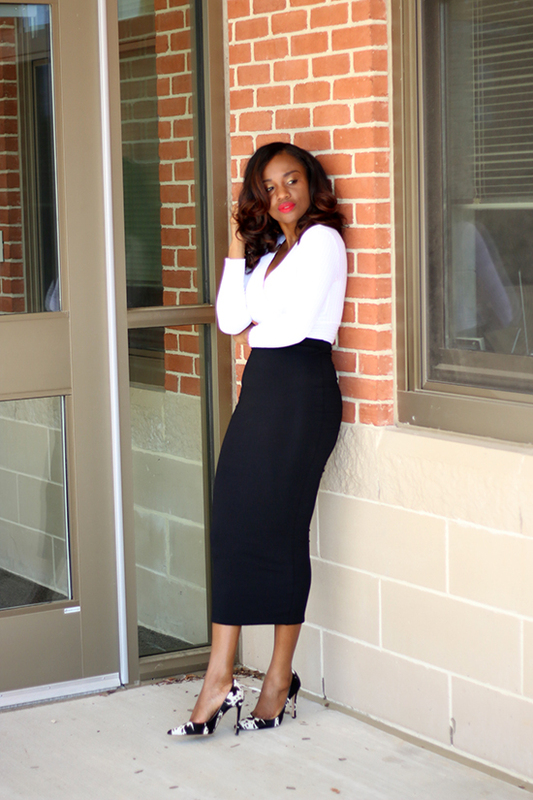 Today's I have another black and white look, which to me never gets old. 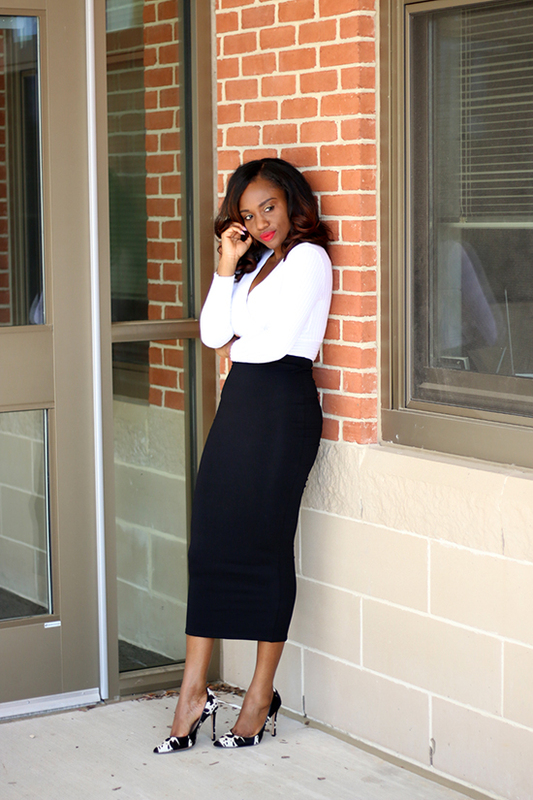 Its simple and classic; there are so many different ways to incoporate black and white into your wardrobe. 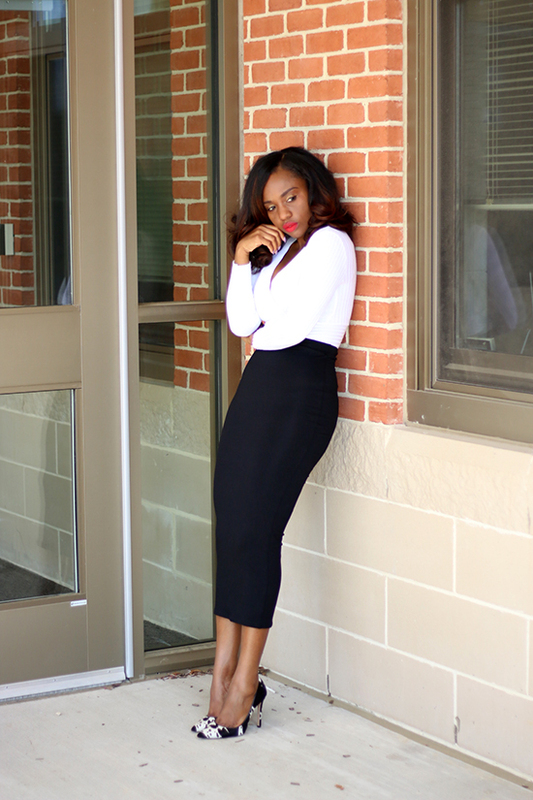 For this outfit, I paired a wrapped top with a longline midi skirt with minimum accessories. 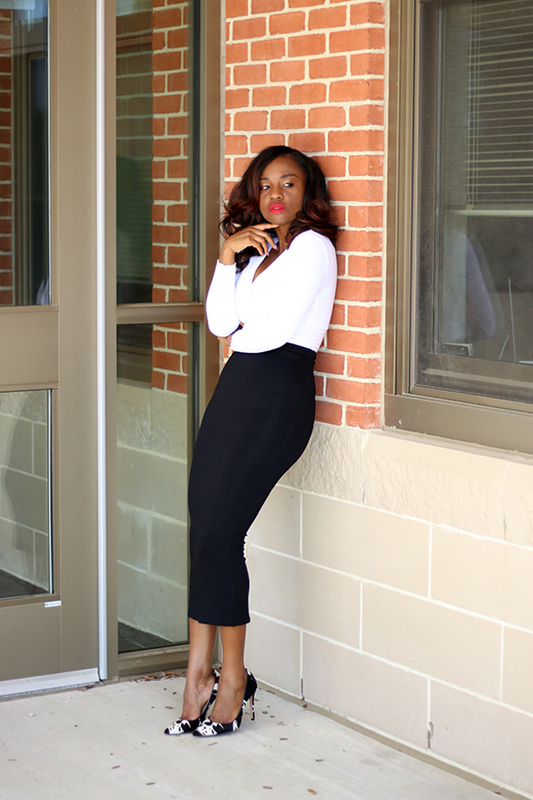 I completed my look with printed pumps which goes well with the black and white theme. Happy Monday, hope you had a great weekend. 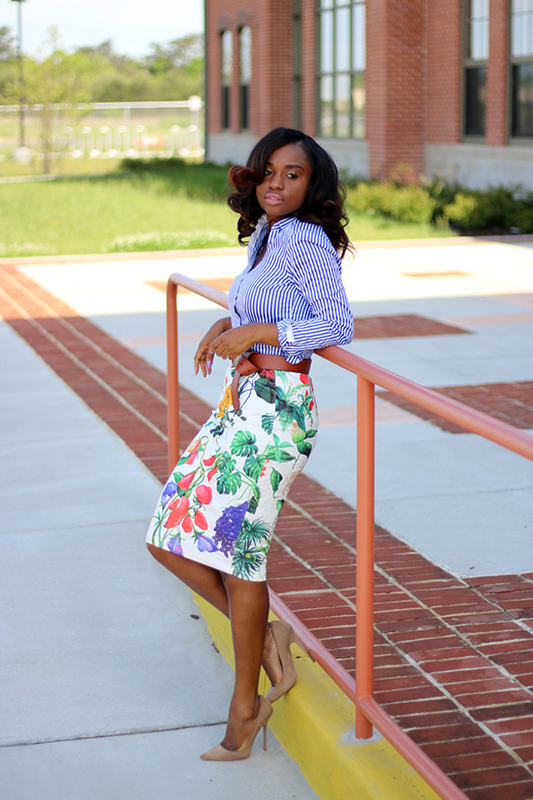 Its always fun to play with colors and prints for my work wardrobe. 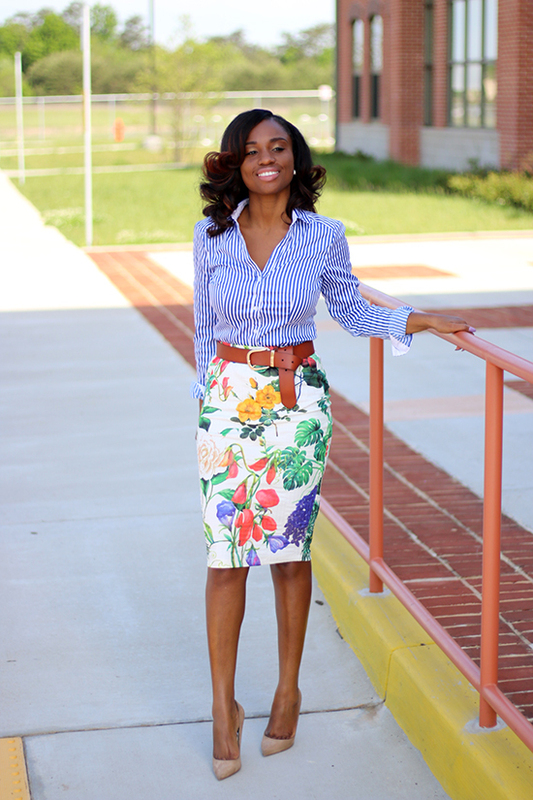 Today I'm mixing prints by pairing a striped shirt with a floral skirt. 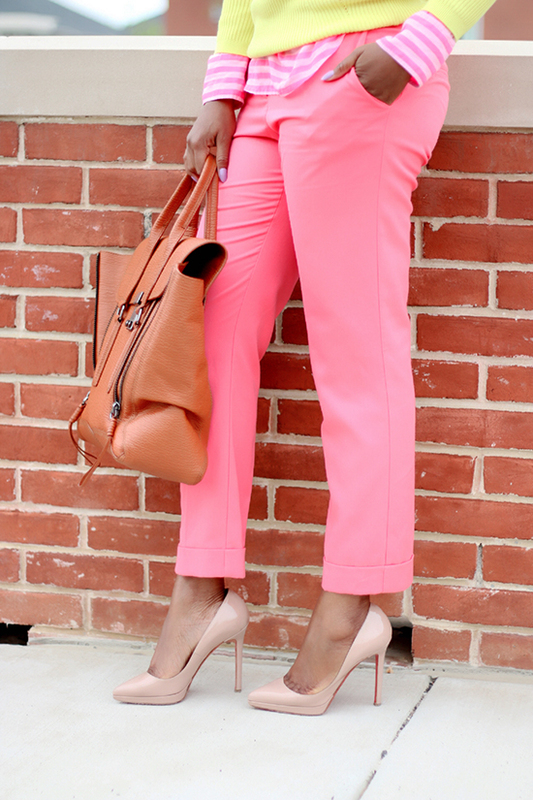 I completed my look with a tan belt and beige pumps for a complementary and clean look. Happy Friday, quick hello to wish you a great weekend. 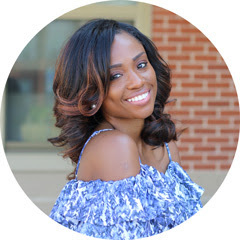 Although leather (and imitation leather) skirts are normally worn during the colder seasons, they can be a perfect staple during warmer seasons by pairing them with a casual t-shirt, crop top or a chiffon blouse for a more sophisticated approach. 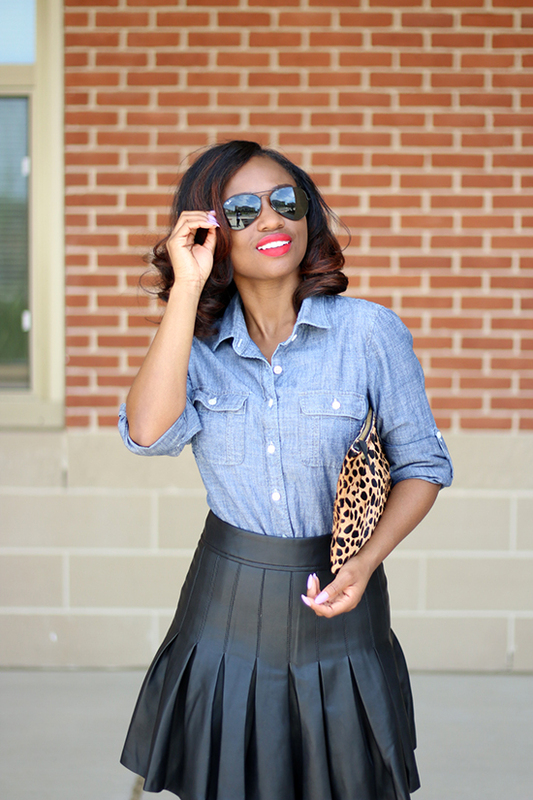 I opted for a casual take by pairing my leather mini with a chambray top. For contrast, I paired the outfit with beige pumps and accessorized with a leopard clutch which goes well with the overall black and beige ensemble. 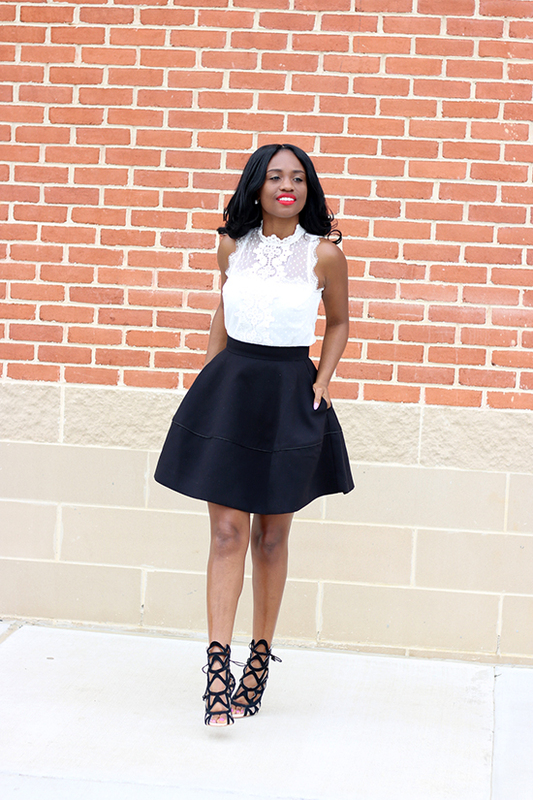 Today I have another black and white look; pairing a flare skirt and lace top. 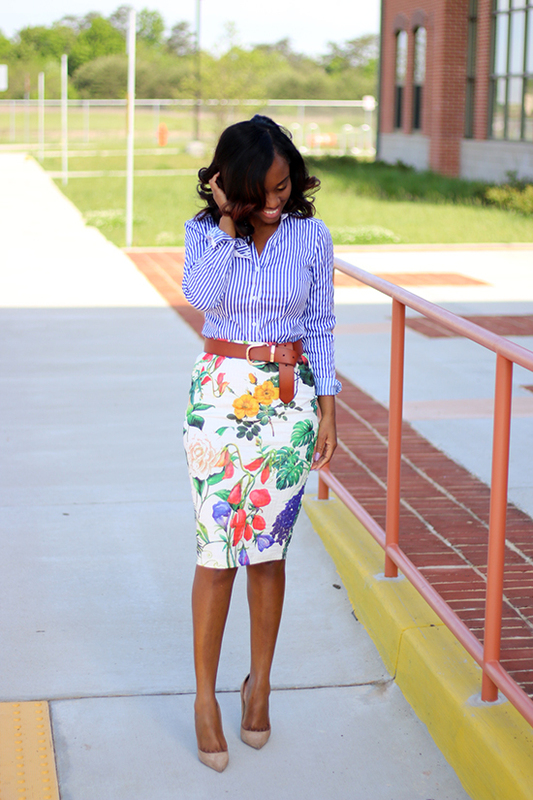 I've been on the hunt for the perfect flare skirt for some time and love this the moment I saw it especially at a discounted $20. My size was unfortunately sold out so I purchased it a size bigger and got it altered. I adore the detailing on this lace top. 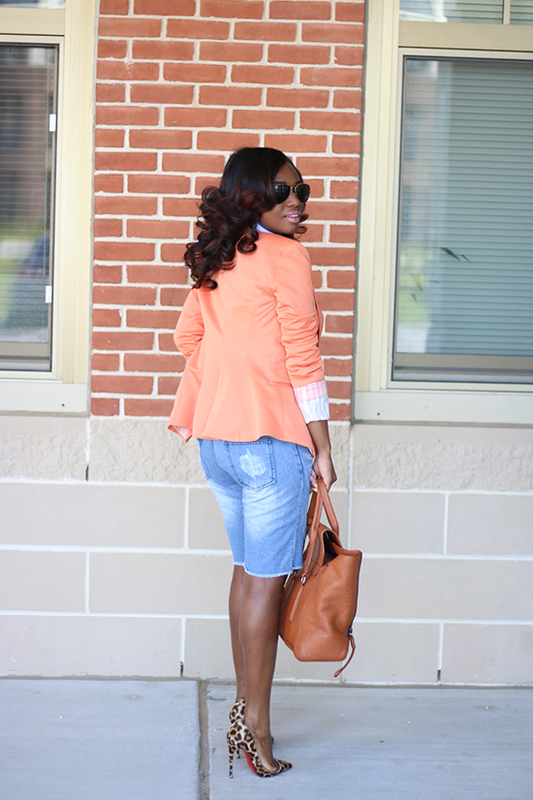 I have styled it a couple of different ways and will be showcasing those outfits soon on the blog. 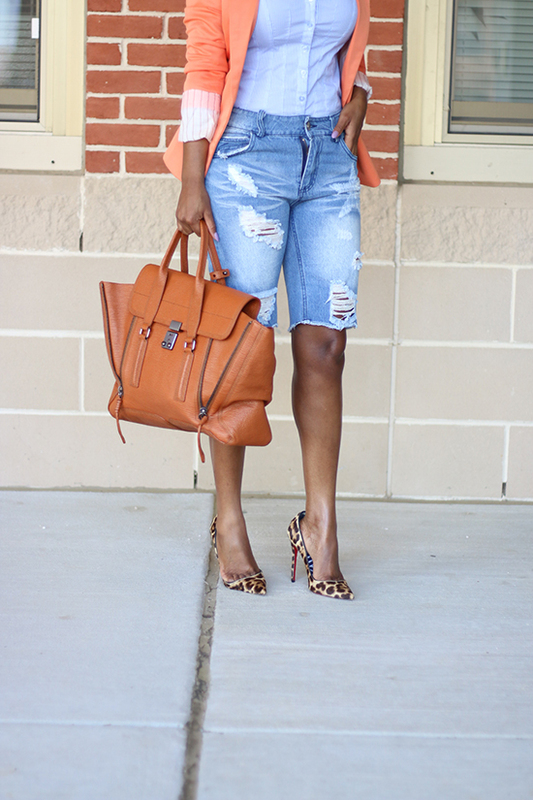 My weekend uniform always consist of jeans mostly a distressed pair. 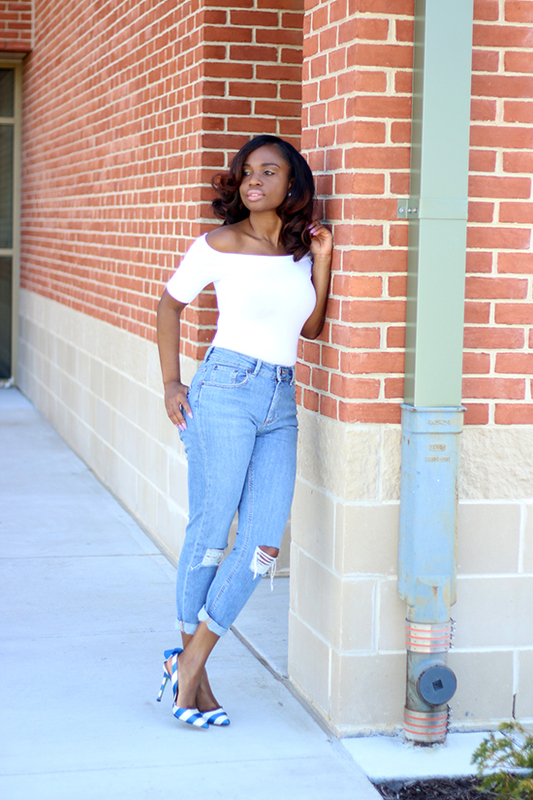 I may pair them with flats and a basic t-shirt for errands or a glossy top such as this and metallic pumps for a quick bite with the girls. 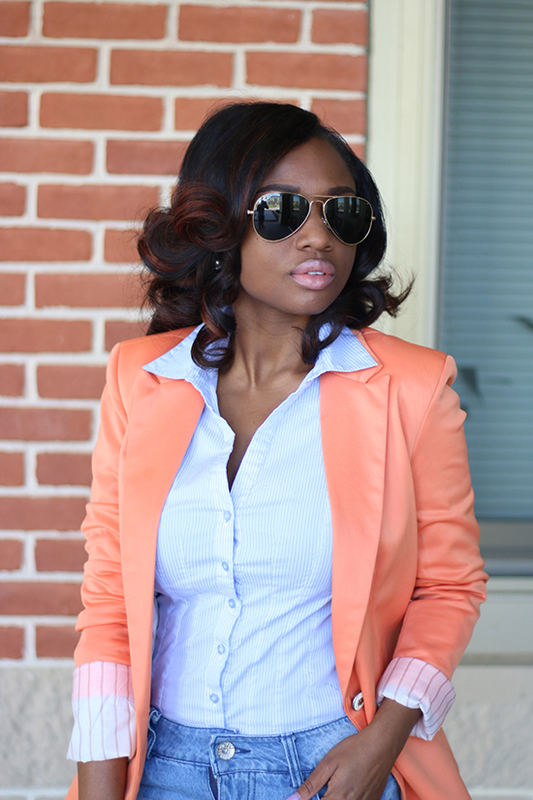 I also love how this top is versatile enough to be paired with a pencil skirt and blazer for a more professional look. Thank you for stopping by. Have a fabulous weekend! 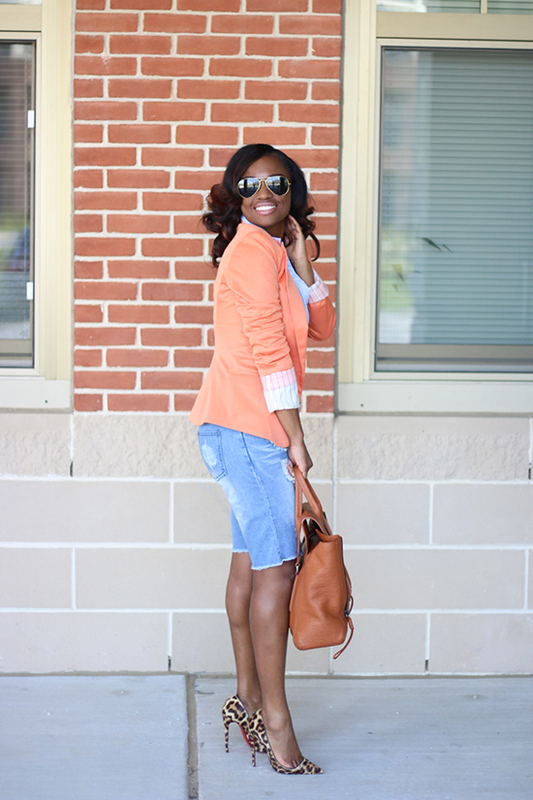 What better way to refresh your off duty wardrobe on a gloomy day than with bright colors. For today's spring look, I paired pink crop pants on pink striped top. 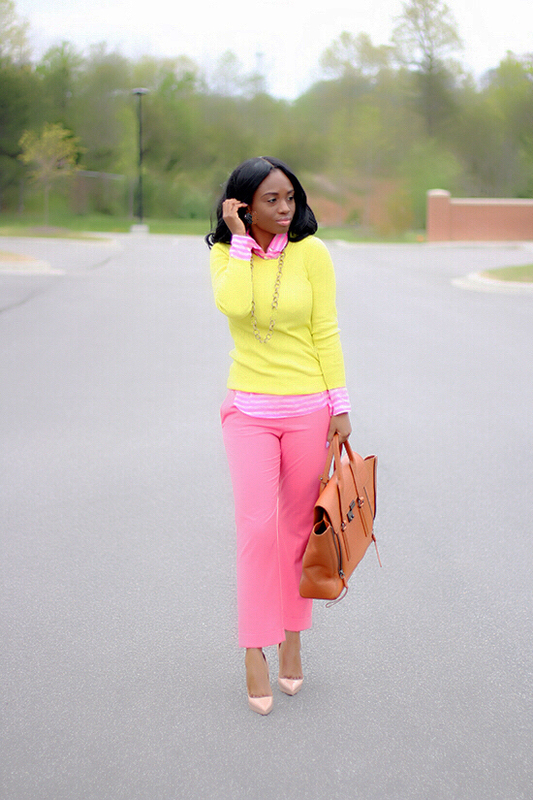 For a brighter and complementary look, I added a bright yellow sweater. The sweater is comfortable and lightweight, which is perfect for this season and great for layering on colder days. I added a chain link necklace for a playful appeal. 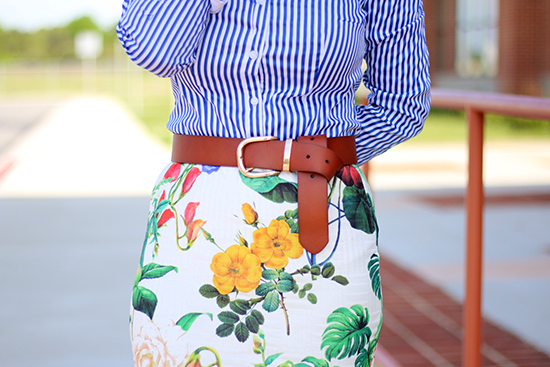 This post has been brought to you by Banana Republic. All opinions are my own.